You want to use the best SEO practices when writing your product descriptions. Creating compelling text will help sell your products, but writing text that search engines ‘like’ will help them show up in search results. These quick tips will improve your product’s descriptions for “saleability” as well as their search engine visibility. Rather than just filling up space with a meaningless description, use words that will grab the reader’s attention and really sell them on your product. Use words that emphasize the benefits of your product. Here is a list of words that can help attract attention. Describing your products in detail can help search engines identify individual products. 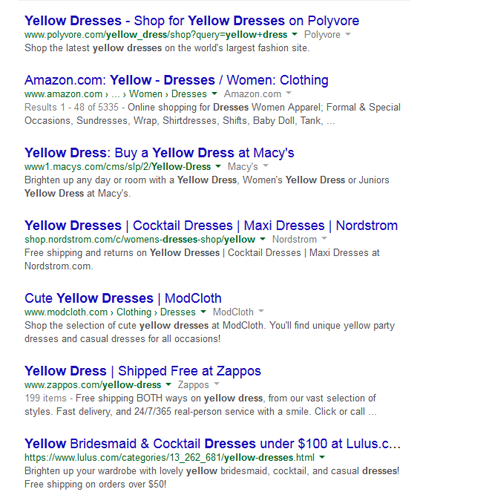 For example, if someone is searching for a dress, they usually use a color or style to describe the dress they want in their search query. An objective of running a successful online store is to have your products show up in search results. That is why you want to be as descriptive as possible. What should you describe? Don’t use too many superlatives in your description. Use the product’s benefits to show off how great it is. Every product has a specific target audience that finds it most attractive. Some products might appeal to everyone, and some only a select few. Understand who your store’s target audience is and be sure to use words and descriptions they will understand and more importantly that will appeal to their needs and wants. How does your target audience apply to SEO? These customers are the ones who are going to be searching for your products. If you sell tools online and use a description like “cute hammer” and “adorable nail gun” the likelihood of your products showing up in search results is low; unless you do actually sell cute hammers suitable for children. If you are a reseller of a certain brand, don’t make the mistake of using a very similar description that the manufacturer uses. There is a very good chance that other stores are using those descriptions for the same products too. You could possibly be punished for “duplicate content,” depending how close you copy the manufacturer’s description. Instead, take the extra time to write your own unique content: Google will reword you for your efforts. URLs, if done correctly, should be relevant to a page’s content. An SEO friendly URL should contain relevant keywords and should follow a type of pattern. For instance, www.storename.com/category/productname/description. This is the structure that ProductCart follows. When enabled the store can automatically generate these URLs for you. Just follow the directions under your store settings to set this feature up. This is a really easy one to do. When saving your pictures, use keywords to help boost SEO. Again, think about what your customers are searching for and use that to develop a file name. For instance, instead of saving an uploading your new pink dollhouse photo with a filename of “img10045.jpg” instead name the file, “pink-dollhouse.jpg”. Just a simple task like this can help increase your product’s chances of showing up in search engines. Getting reviews for your products is a great way to help sell more products, but also improves their search ranking. Use social media and other types of promotions to encourage your customers to leave feedback on your site. Don’t try and trick the system with fake reviews. This could really penalize your site. Socially promoting your products and services will increase the organic traffic to your site. The more organic traffic you have, the better your site will rank for search engines. When linking to your products, use keywords and relevant information about that product. When writing your descriptions, think about how you can help your potential customer make the decision to purchase. If you sell clothing, have you included information about care and washing? How about sizing info? Do these shirts run small? Will the customer need batteries, cords or other accessories? Does the product ship separately? Is that teddy bear the softest plush toy you’ve ever sold? Is that toy only suitable for ages 5 and up? Think about the things your target audience will want to know (moms might worry about safety ratings, appliance shoppers might want to know about the manufacturer’s warranty), then make sure you’ve told them. Check back for more tips on improving your ProductCart store. Have a suggestion? Leave it in the comments section below.